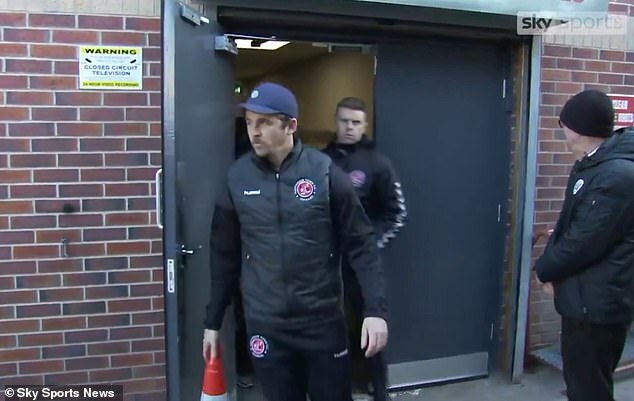 Fleetwood Town boss Barton, 36, had been accused of punching Barnsley’s German manager Daniel Stendel in the tunnel following Saturday’s game. Moments later, police were seen stopping Barton from leaving Barnsley’s ground following the League One game, which the South Yorkshire club had won 4-2. A police spokesperson added: ‘Officers investigating an incident at Barnsley Football Club on Saturday have arrested a man on suspicion of racially aggravated public order offence and racially aggravated assault. ‘The man attended at a police station and was arrested today, Wednesday 17 April. He remains in police custody for questioning. ‘We would ask members of the media and the public to refrain from speculation in relation to this incident as it could potentially harm the investigation.